One of my most vivid early video game memories I have was when I was young and my family rented a strange game from Japan based solely on how weird it looked. That game just so happened to be the classic SNES RPG Earthbound. I was immediately hooked and it quickly became one of my favorite video games. Earthbound still retains that title to this day. A while later I was eventually able to pick up my own copy of Earthbound when I found it on clearance (with how much the game is worth today it was a steal). I bring this all up because when I first saw YIKK: A Postmodern RPG I was immediately reminded of Earthbound. From the quirky enemies and locations, you could tell that YIIK: A Postmodern RPG was inspired by games like Earthbound and other RPGs from that era. YIIK: A Postmodern RPG’s story is a little hit and miss but the original combat mechanics and quirky environment are hard not to love. We at Geeky Hobbies would like to thank Ackk Studios and Ysbryd Games for the review copy of YIIK: A Postmodern RPG used for this review. Other than receiving a free copy of the game to review, we at Geeky Hobbies received no other compensation for this review. Receiving the review copy for free had no impact on the content of this review or the final score. In YIIK (why-two-kay): A Postmodern RPG you play as Alex. It is the summer of 1999. Alex has recently graduated from college and has returned to his hometown. He quickly realizes that things are not as he remembered. As he wanders around his hometown he witnesses a woman mysteriously vanish from an elevator. In his quest to figure out what happened, Alex teams up with some old friends and makes some new friends from a website dedicated to the paranormal. They soon discover that there is more to the disappearance then they first thought. As the next millennium approaches, will Alex and his friends be able to save the world before it it too late? 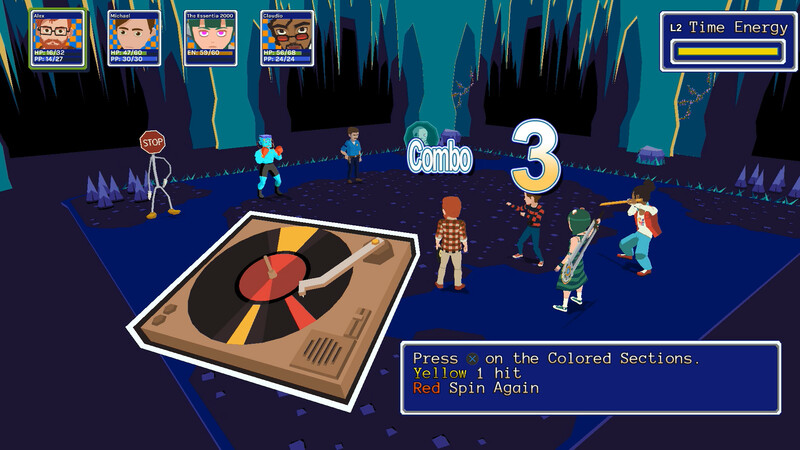 YIIK: A Postmodern RPG is a modern take on RPGs from the SNES to early PS2 era. Like a lot of RPGs from this era, the game involves turn based battles where the characters take turns attacking. While the games that inspired YIIK: A Postmodern RPG mostly had you choose attacks and then hope the randomly generated numbers fell in your favor, YIIK modernizes the gameplay. Instead of just selecting an attack, you have a direct impact on how successful an attack will be. While attacking and defending, you will play little minigames in order to determine how successful you are. Most of these minigames involve timing, button mashing, or quick reactions. The more successful you are in the minigame, the more damage you will deal or the less damage you will take while defending. This concept of using minigames for combat is not totally original as there have been other RPGs that have utilized similar mechanics for combat. I still found the combat in YIIK: A Postmodern RPG to be quite satisfying. Basically every character’s normal and special attacks have different minigames that you will have to play. There are even several different minigames used for defense. While most of the minigames have similar mechanics, they do play differently. These minigames are kind of basic but I enjoyed them. I really appreciate that they bring some skill into combat instead of just hoping that luck will be on your side. They also do a good job breaking up a lot of the monotony found in a lot of turn based RPGs. In addition to changing the battles themselves, the combat has been modernized in some other ways. When you are in the overworld map, you will randomly encounter battles. Everywhere else in the game though the enemies appear on screen so you can avoid them if you so choose. The quantity of battles you encounter also seem to be considerably less than most RPGs. YIIK: A Postmodern RPG seems to be more focused on quality than quantity. Instead of fighting a lot of short battles, you will fight less battles but they are longer. You generally acquire enough experience from a typical battle that you can gain a level every three to four battles. As far as the combat difficulty, I wouldn’t consider the game to be particularly difficult. Unlike a lot of RPGs you don’t really have to grind. Basically all I did was fight the enemies I encountered in my journey and never went out of my way to fight other battles to level up. With this approach there were maybe two boss fights that were even somewhat challenging. I would say that I did pretty well in the minigames but you could also do quite a bit better which would make the game even easier. The main reason that the battles aren’t that challenging is that you will always be swimming in items and money. I am typically not the type of player that likes to use items in video games but you don’t really have to worry about it in YIIK: A Postmodern RPG. If you fully explore the environment you will receive plenty of healing items and money. As items are quite cheap in the game, you can always buy a bunch of healing items if you need them. Whenever you encounter a tough battle you can just keep using healing items to stay in the fight until you ultimately succeed. In addition to the battles, YIIK: A Postmodern RPG includes some light puzzle mechanics. Throughout the game you will be given various items/abilities that you can use to interact with the environment. The game uses these abilities to add some puzzles to the game. I play a lot of puzzle games so this might be clouding my judgement some, but the puzzles in YIIK: A Postmodern RPG are really easy. As long as you remember which items/abilities you have available to you, you should be able to solve most of the puzzles almost instantly. If you have ever played a video game that includes any sort of puzzle, you shouldn’t have any trouble with the puzzles. The puzzles are far from challenging but they do add some variety to the game. For the most part I think YIIK: A Postmodern RPG did a good job eliminating a lot of the problems with older RPGs. There are still a couple issues that still remain in the game. The biggest problem I had is that there is no way to sort through your inventory. If you are like me and never get rid of anything, you will have to scroll through a lot of items to find the item that you are looking for. The game could have really benefited from having some way of sorting items by their type. Thankfully while in combat and equipping items you don’t have to go through the entire list of items. Otherwise YIIK: A Postmodern RPG has a couple other small gameplay issues. First the game has quite a few loading screens. Each time you start a new battle or enter a new area/building there is another loading screen. The good news is that the loading times are quite quick with most taking less than a minute. I also wish the game had a better way of navigating the overworld. There is a way to quick travel to certain areas of the map but most areas you have to travel to on foot. This wouldn’t be so bad except for the random encounters which get kind of annoying after a while. So let’s move onto the story/atmosphere as outside of possibly the combat, it is generally the most important thing for an RPG. What initially intrigued me about the game was the fact that it looked really quirky. I have always liked weird games and in a lot of ways YIIK: A Postmodern RPG is a very strange game. As you can probably see from gameplay clips, the game includes quite a few quirky enemies. From walking stop signs to turtles that know martial arts, the enemies in the game are definitely on the stranger side. As a matter of fact outside of the typical rat enemy, I don’t think there is another normal enemy in the entire game. It doesn’t end with just the enemies. For example when you first arrive at your house you will notice that your house has a tree that grows hamburgers and money. Add in quite a few 80s/90s pop culture references and I really enjoyed the quirkier side of the game. The thing is that while the game is usually quite quirky, at times it can get kind of dark. The game is rated mature due to a decent amount of swearing, and discussions of depression/suicide. The game also tends to get philosophical at times. These elements of the game are in stark contrast to the game’s quirkiness. While both elements on their own would have been fine, I just didn’t think they worked that well together. I think the game would have been better off sticking with one or the other. I personally would have preferred that the game stayed on the weird path. As far as the story, there are things that I liked and some things that I think could have been better. I am not going to get into story specifics in order to avoid spoilers. I would say that I liked most of the story. It has some unique and interesting ideas that I haven’t really seen in other video games that I have played. The story kept me interested where I wanted to see how it would end. Occasionally I felt the story hit some bumps along the way though. While he somewhat redeems himself later in the game, at least at the beginning of the game Alex is kind of a pretentious jerk. This doesn’t ruin the story but he is not a character that I would hang out with in real life. The story also drags a little at times as it gets philosophical and somewhat hard to follow. In general I liked the story but there are a few areas where I think it could have been better. Due to the fact that YIIK: A Postmodern RPG is an RPG, it should not surprise anyone that the game is pretty long. It is going to be hard to give you a specific length as I am the type of player that generally tries to explore every nook and cranny. I would say that the game will take most players around 30-40 hours to complete. If you want to just focus on the main storyline, I would guess the game would take closer to 30 hours. If you complete the various side quests and fully explore the environment, I could see the game taking closer to 40 hours. I am unsure how much much replay value the game has though. The game has a new game+ feature but I didn’t have time to check it out. There is a lot that I liked about YIIK: A Postmodern RPG. For the most part the game does a really good job paying homage to turn based RPGs from the SNES to PS2 era while also modernizing some elements. The combat takes traditional turn based combat and adds in minigames to determine how much damage is dealt. While the minigames are kind of basic, they add quite a bit to the combat and for the most part are fun. I also liked that the game is quite quirky/strange. The only two major issues I had with YIIK: A Postmodern RPG is that the game is quite easy and the story hits a few bumps here and there. People who have never really cared for turn based RPGs, probably won’t like YIIK: A Postmodern RPG. If you like turn based RPGs with a modern twist and the story sounds interesting to you, I think you will enjoy YIIK: A Postmodern RPG. The addition of fun little minigames keeps the turn based battles interesting. The story and atmosphere thrives when it embraces its quirky nature. The combat and game as a whole are pretty easy. The story hits some bumps along the way and the main character is not that likeable at times.